Valiant 300 & 400 Two Speed pictured! NEW 800, 800N & 1000 sizes! Like the aerospace-type designers they are, Accurate approached creating a fishing reel with uniquely clear vision and a good dose of common sense. Accurate came up with a logical way to solve an inherent design weakness with all conventional fishing reels. Instead of applying drag pressure on one side of the reel's spool, Accurate reels feature TWIN-DRAGS. Yep, drag pressure is applied evenly on both sides of the spool. And for the same reasons you don't just put brakes on one side of a car, applying drag pressure evenly makes for a much better fishing reel. There's another benefit, DRAG WEAR and HEAT. Since drag pressure is exerted on both sides, less drag pressure needs to be applied on each side of the reel. For 20# of drag, you'd effectively need to apply 10 lbs. of drag on each side of the reel. This means besides smoothness, you'll experience less heat build-up and resultant loss of drag performance. Another point that influenced Accurate's designs: They entered the reel market after Izorline's Spectra was well established with the Long Range guys. Given Spectra's thin diameter, it became popular to use heavy line on smaller more comfortable fishing reels and still maintain good line capacity. The reels had to be strongly overbuilt, or things could literally "come-apart". Spectra kind of pushed all the gear up one line class or two. In many cases, even a top quality reel would have to be modified by Cal's or Cofe to maintain freespool, because the reel wasn't initially designed for what Spectra has now made possible in terms of drag setting. Accurate recognized the potential of Spectra, and designed their reels to maximize it's best properties. Accurate has created a full series of TwinDrag reels now, and they represent the pinnacle of performance. If ever a line of reels was designed for the long range fisherman, this is certainly it. Accurate spent a great deal of time testing the product, putting their reels through lots of use with the San Diego Long Range fleet, among other demanding markets. As a result, Accurate designed their reels in uncompromising fashion. The components are the best you can buy, the best bearings (6-7 ABEC Class 5 bearings! ), the best aluminum, the best anodizing...not to mention, the best design with TWIN-DRAG balanced fish fighting working for you. Accurate has made major enhancements to their reels since their introduction. The Accurate reels are well worth owning. Their technology is proven - and it's GREAT STUFF! Please note, you will see many spooling options for the reels listed below. It's not our intent to confuse folks, but you do have options here unlike some places and we take pride in the fact we can rig things according to your needs, applications and preferences. We have been pioneers in Super Braid / Spectra rigging and we offer a few methods of rigging the lines together beyond most retailers capability, including the standard long range Bimini to Albright knots, Served and Sato connections. We do not use simple uni-to-uni knots for connecting braid to leader, we take the time to make a better knot, one that will hold up over time and deal with larger fish. Simpler knots don't work as well. You can see videos of what we do on our YouTube channel - CharkBait USA. We can upgrade that connection to one of several options, the benefit with those connections is that the diameter is thinner and that allows the line to flow through your rod's guides more smoothly, has less resistance in the water and is stealthier. If you have questions regarding rigging, please give us a call or zap back an email and we can go over things with you. Bottom line, you have options with us and we're proud of our staff's ability to rig things to your needs rather than simply "slapping" things together. Our knots hold, as does our in-line rigging. We have two excellent special offers going on right now on Accurate's fine line of reels. First off, all reels offered receive the benefit of FREE BRAID SPOOLING - and not just any braid. For a limited time we are including Toro Tamer's SPLICEABLE SUPER BRAID, arguably the best high end super braid on the market today. You'll get 300 yards of the best braid made plus a free reel cover, and mono topshot if required. If you prefer, you can go "solid" on the braid, and even mulit-color depth counter if that's your preference in the Toro Tamer Super Braid, you also may select from Izorline and Momoi. Of course you have many other optional ways to rig up, so pay attention to the spooling options when making your selection. If you don't need the braid, we have an alternate offers. You choose either FREE offer and we'll adjust your billing on your final invoice which you'll see in your mailbox within 24 hours of your order (Monday through Friday). Receive superior quality Super Braid (100% gel spun polyethelyne line) spooling with mono topshot (if desired) at no additional charge. Both offers represent a value of up to $80, and both are excellent. You choose either FREE offer. Receive either quality gel spun Super Braid spooling with mono topshot, Drag Scale or Lure Assortment at no additional charge. Offers represent a value of up to $50 . March 4, 2015: Accurate announced a new 2 year warranty & service program. The reels now carry a full 2 year warranty rather than the industry standard one year. Further, Accurate includes FREE FACTORY ANNUAL SERVICING for their reels! This a big statement from Accurate that they know they have a better product given improvements which have been put in place over the past few years, and most noticeably in 2014/2015. Colored Reels: Standard color reels are held in inventory, custom colored reels need to be produced and will increase wait time. Cost for non-standard colored reels is plus $100 for the first reel, $25 ea for additional reels made at the same time. Standard colors: Fury - silver with gold, Dauntless Series - silver with black, BX Series - silver w/blue trim. The Valiant series have three color variants: silver with red trim, silver with blue trim and solid black. Other colors available at added cost include: red, blue, ice blue, green...perhaps purple but I've yet to see one. As of this date we have recieved all sizes, from 300's to 500's. Supply is still slim, Accurate is playing catch up with their intro orders from ICAST 2018, but all sizes are being produced and we do have inventory to support our offers (not as many as we'd like...but we're filling all orders on these high demand reels in a timely manner at the present time). Accurate showed off their first Star Drag reel at ICAST in July 2018, a true twin drag star design reel, but accomplished differently than Accurate's twin drag leverdrag reels. There are a couple things distinguishing Accurate's design. First off, twin drag application to a star drag reel. Rather than a drag stack, metal and carbon fiber washers on one side of the reel, with Accurate's design there's a pressure plate and friction washer on both sides of the main gear. It's not applying pressure on both sides of the spool like their leverdrags, but instead are incorporating pressure on both sides of the gear itself - that's why the gear case is a bit chunkier than other reels designs. The result is, like other Twin-Drag reels, smoothness that comes from only having to apply half the pressure of a traditional design since that pressure is applied to both sides of the spool rather than only one. The spool is also sleeved, excellent freespool the result. The other thing Accurate mentions with their new designs is CVX technology. That's an interesting buzzword. Don't quite know what that means in machining or fishing. It has a distinct meaning in government (an app for engagement...bs). In Accurate's terminology glossary, CVX refers to the way the frames were cut out verses BX or other series reels, more weight trimmed from the frames while retaining similar strength. Bottom line, they are light like the Valiants, similar weight savings from more traditional designs. As the images below attest, we have received many of the new reels. Not as many as we have on order, not all models, but our back orders have been covered and we can cover a few more orders before we run out... Pictured below, Tern 300 and 400. Like the Valiant, the tiny Tern 300 does not have a reel clamp, 400 and up do include the clamp. All models have a clicker, a loud one. UP TO 300 yards Toro Tamer 4 or 8 strand Solid BRAID supplied with selection above! - SELECT options above, then if you wish additional yardage make your selection below. -New Micro Reel with Mega POWER! Accurate's newest fishing reel is the Valiant, a very interesting micro small model with mega power. Overseas Micro-Jigging has become a popular method for catching fish. Small jigs, fished vertically on rods with VERY light action can produce a catch when other methods won't do squat. In areas that have been "fished out" folks are catching fish they'd have missed without this method employed. Whether or not that's a positive step in overfished waters is not the point, the method is important and useful even in abundant waters, and the innovations in fishing technology used can be applied to different applications. In Mico-Jigging the fisherman works very small jigs, similar to how one should fish knife jigs (and similar iron) on parabolic rods matched to the jig weight for best action. Then, once hooked up the angler points the rod directly at the fish and uses the reel's power to crank in the fish. There's a certain amount of finesse and a certain measure of raw power employed in fishing this method. All the stress of the fight is handled by the reel, not the rod. Here, rather than Asia, micro-jigging may not become the rage, however the concept of taking larger fish on smaller gear is something we have all learned to love, and no doubt Accurate wrote the book on that pursuit. Taking that style of fishing, dropping down to much lighter jigs and rods is what folks are doing in this new method of catching fish. Having a reel small enough to balance out on the rod and yet powerful enough to fight the fish is the key. Power is critical, and the new Valiant from Accurate combines superior power to exceptionally light weight - 9.9 ounces! For 2016/17 Accurate further develops the Valiant project with more sizes, the 400 in single and two speed versions, and 500 in standard and narrow widths - and again in both single and two speed form. Accurate showed off the 600 sizes at ICAST 2017, and hinted at two additional models, 800 & 1000 - (all in stock now). COLORS - This has been a hard one for Accurate to address. They've wanted to offer color selection, but it's not an easy thing for the firm to accomplish given all the other time demands in the aerospace end of things. They have now simplified things. Reels are available in silver with red trim as shown in most of our images. You can alternatively select the reel to be silver with blue accents similar to the red/silver shown on our site. You can also order the Valliant in solid black as is shown below. Manufacturer's stated drag measured at strike 20-36 lbs. The 300 size does not have a reel clamp nor a clicker, the 400 size being wider does come with a clamp and a strong and loud clicker, as do the rest of the Accurate Valiant series reels. The 800N and up sizes also offer lugs. For 2017 Accurate expands upon the Valiant series reels. We've received the new 400 size in both single and two speed forms. These new reels are almost the same weight, use the same frame/housing for both models. Weight is 14 ounces. Drag comes in at 20 lbs., specs consistent with the smaller 300 size. except line capacity increases to 300+ yds of 50# super braid. Valiant pricing ranges from $399 to $599 depending upon model and gearing. Please use the drop down ordering menu below to view models and pricing. Accurate is very much committed to these new innovative reels, the most unique product series Accurate has designed. This is their future, smaller, lighter, taking full advantage of super braid lines in all their forms. High drag, low mass, fishing comfort, from a smooth performer. Note, Accurate also offers a full two year warranty with included factory service! The 500 sized Valiant's work well with 50# braid, offering 350+ yards on the narrow and 450+ on the standard width reels. Depending upon the braid used, hollow verses solid, 8 or more strands verses 4, it's possible to gain capacity. The upgrade lines (we include those options at no additional charge) move the reels into the 400 and 500 yard mark (100% braid 12 or 16 strand hollow-core or 8 strand solid). For most casting applications, it's best to work with a leader of 50 yards or greater (certainly cover your casting distance). For 2016/17 Accurate further develops the Valiant project with more sizes, the 400 in single and two speed versions, and 500 in standard and narrow widths - and again in both single and two speed form. At the 2017 ICAST show Accurate showed off their new 600 size which is now available (three sizes, 600NN, 600N and 600). And, for 2018 we have already received the 800, 800N and soon the 1000 sized reels. Spooling - I hope we're not intimidating you with all the options, but folks tend to rig up Accurate reels in several ways and we try to accommodate all applications. We include up to 300 yards of Braid/Spectra at no additional charge along with your mono topshot (if required) - that's the standard configuration. You can also select "solid" or hollow core Braid/Spectra and increase your line as desired by 100 yard increments by making use of the Optional sections below. Offer includes FREE BRAID RIGGING - Spliceable Hollow-core or "solid" 4 and 8 strand lines. Note, other colors may increase cost by $100. Call for more information. First off, the FURY Series offers serious anglers Accurate performance at a VERY COMPETITIVE price point. This is achieved by simplifying design - these are single drag reels rather than twin drag design which is what you get when you upgrade to their Boss and Dauntless series reels. A true dual drag reels is more costly to produce, between Accurate's patent and the cost, little reason for other folks to attempt the technique. (Avet does have a dual drag series, their TRx reels - but they go for about $800 and do not go about applying pressure in the same manner). The Fury gets the most significant cosmetic improvements for 2015, now they're polished and their weight has dropped considerably and machining is more refined. The new Fury series will bring many new fishermen to appreciate the quality inherent in Accurate reels. These also get the new AR bearings, no dogs, only the improved bearings for the anti-reverse system. These are beautiful reels that do more than their competitors can in terms of materials used and drag capability. These reels will fish up to 20 lbs of drag measured at strike - meaning they are quite capable of fishing the range of line tests up to 60 lb.. Also, the freespool performance has been upgraded - same enhancement first incorporated in Accurate's Dauntless design. The new Fury series offers high useable drag levels, they spin like tops and are similar in that respect to Accurates Dauntless series - nothing spins quite as well right out of the box at this point in reel development. The Fury series incorporates high quality manufacturing, very nice cosmetics, and the fishability factor per dollar invested is high. Value does indeed meet performance with the new Fury series reels. Spooling - I hope we're not intimidating you with all the options, but folks tend to rig up Accurate reels in several ways and we try to accommodate all applications. We include 300 yards of Braid/Spectra at no additional charge along with your mono topshot (if required) - that's the standard configuration. You can also select "solid" or hollow core Braid/Spectra and increase your line as desired by 100 yard increments by making use of the Optional sections below. The Fury series comes standard with "solid Braid" actually it's not solid it's 4 to 8 strand braid, it isn't hollow core braid. Hollow core carries an added cost on the Fury series. The BX and the Dauntless series reels include your choice of hollow or "solid."! For line capacity information please check our Accurate page, the manufacturers website, or just give us a call. FREE OPTIONS: Toro Tamer Solid or Hollow Core Spliceable Braid, Izorline, Momoi, Cortland "solid" - 300 yards free. Fury series include solid, BX and Dauntless your choice of hollow or solid. Added Cost OPTIONS: Spooling beyond 300 yards, Sato Hollow Core leader connections and served connections. You choose either FREE offer. Receive either quality gel spun Super Braid spooling with mono topshot, Drag Scale or Lure Assortment at no additional charge. Offers represent a value of $50 or more depending upon reel selected. Accurate reels are now available in several colors. See drop-down menu in the ordering section for options. Some colors may delay delivery by two to three weeks. Accurate announced new pricing 3/4 for the Fury Series making this series very affordable...and worth every penny. Expect the Boss Series to be discontinued by Accurate. The Valiant series represents their direction for the future, equally capable but lighter and more innovative in design. The new BX or Boss Extreme Series of reels incorporate the improved AR bearings AND make use of Accurate's patented Twin Drag system. With the Twin Drag the reels can attain higher drag capabilities with half the drag pressure applied to either end of the spool. Less heat buildup, smoother drag performance, and more drag then you'll need on reels of this size. In terms of numbers, these are made to fish with up to about 30 lbs of drag, and do so well without binding issues. Now we also have the Boss Series reels in both single speed and the TWO SPEEDS ARE BACK IN THE LINE! Also, the freespool performance has been upgraded - same enhancement first incorporated in Accurate's Dauntless designs. In the past the BX series offered a mechanical cast control, that is no longer the case - no cast control offered on the BX or any series of Accurate reels. The Dauntless Series represents Accurate's best series, nothing pulled from these which would aid their performance - they have it all. They make use of the same new AR bearing as well as dogs for this series of reels anti-reverse system. Redundant, and robust. Larger shaft, heavier duty internal components, built like a tank...but they are light in weight, too. Like the Boss series above, they've even taken weight off the handle arm but also increased it's thickness to retain strength while trimming weight at the same time. Again, these are made to fish up to the 30-32 lb range if needed. These are Accurate's best reels. You could say, these are the ATD's of the casting world. ATD quality, but made for folks that cast and jig...and with the weight savings achieved you can be comfortable fishing 'em all day long. Accurate pulled out all the stops in designing the Dauntless series reels. They are made from 6061-T6 Aircraft Aluminum, 17-4 heat treated stainless steel gears and LARGE 17-4 heat treated gear shaft for increased torque and strength. The lever drag is calibrated for very accurate drag settings. The reels feature a longer power arm and ergonomic handle for power and comfort. The reels incorporate Accurate's 2 speed shift mechanism for solid engagement. For folks focused on jigging, these are the best in the business. For those casting lighter baits, the freespool will put smiles on your face and fish on the deck. Put simply, these are the best reels Accurate has ever produced, and that says quite a lot. and proudly manufactured in the USA! The ATD's are the finest reels on the market, no compromises in any area. Accurate built these with a no holds barred approach to design. Cost was not a consideration, quality of production and performance were the only two criteria used in creating these reels. We could go on, expounding upon their merits, the small and large things they do differently than other reels in terms of design. But, frankly there's no need to ramble on. The ATD Platinum series reels are the finest reels made today. End of story, nothing else to add. Talk to any dedicated fisherman, ask them what reel they'd most like to own if price were no object. Hands down, the answer will be Accurate ATD. Months, no make it years of waiting, and then in '05 Accurate finally introduced their Twin-Spin series of reels with the model 30 the first produced. In one word, SWEET! Since the introduction at the Fred Hall Show March '05 folks have absolutely been salivating for these much anticipated reels. Accurate slowed production, allowing for more time for evaluation, more fishing hours on the reels and some enhancements. Enter the 2006 Accurate TwinSpin 30: the sportfishing world’s first, true dual- drag, ocean spinning reel with a braking system applying equal braking pressure to both sides of the reel spool. Never has a spinning reel had the benefit of this kind of power, this kind of drag performance. The Twin-Spin is a true twin drag design. The reels are made from 6061 billet machined aluminum, spool, body and rotor. They use 14 ABEC 5 stainless steel bearings, TITANIUM friction washers, and stainless steel gears. The 30 will hold 325 yards of 30# mono or 500 yards of 65# Spectra. Some folks opt for the 80# backing, if desiring to run 60# mono. We also offer the TwinSpin 30 in the "L" or low geared version which sports the 4:1 gearing. Externally, the TwinSpin 30 offers a quick-change spool capability with a drag pre-set knob located on the top of the spool. By using the drag registration lines found encircling the spool top, drag pressure can be precisely adjusted. Since the patented TwinDrag mechanism of the TwinSpin 30 is retained within the spool, optional spools with lines varying in breaking strengths can be quickly and easily switched without having to readjust the drag settings with each spool change. Line disengagement and pickup is via a rugged, manual bail mechanism. An ergonomically designed power knob conforms naturally to the shape of an angler’s hand. There has never been a spinning reel like the Accurate Twin-Spin, never. Never so much power, drag capability, casting proficiency, all rolled up into a spinning reel capable of taming such large fish. For tossing live bait, smaller 'denes or 'chovies, artificials or plugs this reel will put some meat on the table or treat you to some great catch and release fishing. It's going to set some records, that's a given. Accurate expanded their line of spinning reels to include the smaller model 20 and 12 in 2007/8 and will no doubt bring us more robust spinning reels to accomplish those things that only spinners can do. For example, tossing poppers. Try that with a conventional reel, darn tough. But, with an appropriate strength spinner this is something that's very do-able, and effective. Looking for the largest, strongest spinning reel on the market? Accurate just finished production of their Big Dog, the SR 50. This beast boasts more drag than a spinning reel should offer, greater size, strength, torque and the meatiest handle we've ever seen to match the power this thing can produce. It's not for everyone, certainly, but for those who demand this type of performance - you've finally had your wish come true. Accurate's Twin Spins have demonstrated some strengths since they first hit the market. There have been significant improvements in the time since their introduction, and at this point they have earned respect from folks targeting fish that warrant such a superb reel. The little SR6 brings Twin Spin technology down in size, and that was one complaint I heard from guys who wanted the power, but in a smaller and lighter sized reel. I believe these will be solid pieces, wonderful reels to fish for a wide range of gamefish, from surf to offshore use. For spooling I'd run 20-30# hollow braid and top off with a fairly short leader. That would be my call, but others may opt for different rigging. Some will no doubt load 'em up with 8 to 12# mono and be done, but the capacity gained by braid and the reduced issues of line memory make braid spooling the best way for most folks these days. With mono you are looking at about 120 yards of 10# line, going braid bumps things up considerably. Going hollow core spliceable 20-30# Toro Tamer 16 strand will provide you more like 150-200 yards to play with, and that's a great range for this type of reel. At this time there are now several Twin Spin sizes, 6, 12, 20, 30 and the big dog 50. In the case of the 30, these are available in two different gear options, speed and power at 6 and 4 to one. We stock the standard silver anodized reels as well as our exclusive candy apple red versions. Please use the drop down menu below to check prices and options. Made in America, and proud of it! Just thought you would like to see the first fish caught on the Accurate reel and Ahi Assasin rod combo we put together. Awesome combo, whooped the a.j. twice as fast as traditional tld 25 with standup rod. Accurate has introduced a few new accessory products recently. They have a handle option which may appeal to some, a new soft grip replacement knob for the Boss Series reels and a new Pit Bull clamp assembly which goes nicely on a cork tape deckhand style rod. The rod clamp is much wider and less prone to loosening, slipping or getting mounted askew. There's more to grip with on the optional clamp, robust too with six Allen nuts used for the attachment. It will fit the Aftco #3, Fuji #26 and smaller reel seats as well as corktape rods that are around 1 to 1-1/8 inch in diameter. For our reels, it will fit all the standard widths, the 665N/600N in all it's forms, the 665NN/600NN in all it's forms as well as the 870N 4:1. It will not fit any of the 197/400N in any form, 870XN, 500N or B2-870N. The new soft grip knob can be ordered as an accessory kit, just the knob, knob with handle or as an option on the purchase of a new reel. To accomplish that, please call or email us with your invoice number once you've placed your on-line order. Please note, the handle options below only pertain to ACCURATE REELS, they are not made to accommodate other manufacturer's products. Accurate no longer is a source for Penn handle upgrades. If that's your interest, please visit our Tiburon page. *Please note, handles and knobs are not a primary part of Accurate's business. If you need a new handle or wish to change a part EXPECT a wait of a month or perhaps more. If you assume this sort of a wait, then you won't be disappointed if it takes this long, and perhaps you'll be pleasantly surprised if things come together faster. B & DPX Series Reels! Add the security of lugs to lug-less reels!!! Here's a much liked, though inconsistently supplied product we've brought you for many years, until they dried up. The old GS bracket was a great idea, but the owner retired and moved to Texas and really was unable to produce the products. * I think he discovered funner things to do living in God's country.... It's been known to happen to Californians who move back to the South (I well know since I spent much of the 80's living there until I was transferred back to California). That's another tale for another time. In any event, we came across another Californian who has a machining business who took up the production of this very worthwhile piece. For those newcomers, the old GS bracket provided a way to add lugs to lug-less reels! Now, that's a darn good thing if you are fishing heavy on a smaller sized reel, or simply want to be sure that a prized reel doesn't take a an unexpected dip when someone gets surprised by a hard pulling fish. The old product was available in two sizes, accommodating Avet's as well as Accurate's and most other manufacturer's products. The new version is NOT available for Avet reels at present, but they do accommodate Accurate, Penn, Daiwa and many other reel manufacturers products. AND, they are now available in five different colors! We have them in Silver, Black, Blue, Gold and of course RED! They are a very nice match to our own Red production Accurate reels. The lugless reel bracket comes without hardware, you will make use of your existing reel clamp's hardware. That should be fine for most applications since the width of the bracket is only about 1/8 of an inch. But, if you have a tight fit on your rod now, you'll probably need to get hold of some longer screws. That on is on you, we can't provide help but Lowes or Home Despot jut might get you covered, be sure to check sizes carefully and go stainless steel. The new brackets are well made, and we're very pleased to say: WE'VE GOT 'EM IN STOCK! The new brackets do NOT come with any hardware. 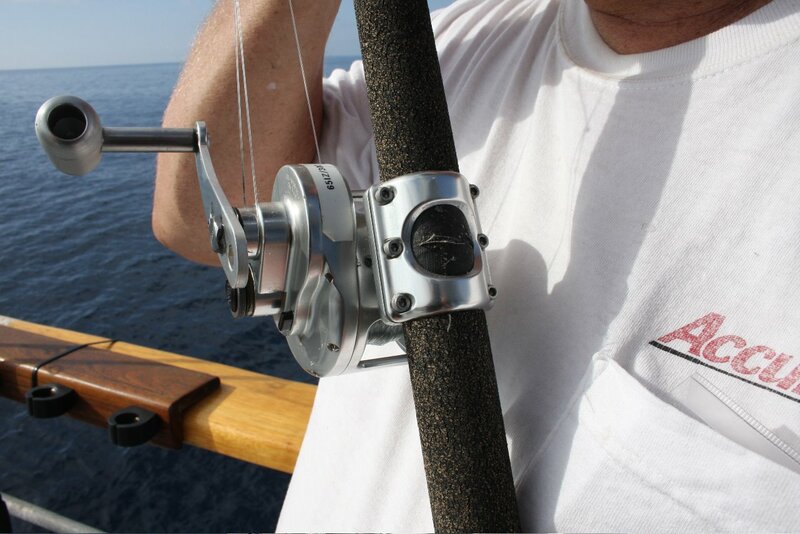 For most reels this presents no problem, the bracket will become rigid once the reel is installed on your rod. For some applications, Accurate reels for instance, it's a good idea to also use two small nuts to secure the bracket firmly on the studs and then mount on your rod. This will require some fiddling and would be best to replace the studs and add a washer and nut instead of using Accurate's stud with nut in-line. We'll cover the hardware since we're better able to grab the right stuff and include what's needed for 1 cent additional charge (because I can't figure out how to make the script work if I don't have a charge...) - just select the last option and write in how many sets of brackets will be used on Accurate reels so that we include the correct hardware for you.